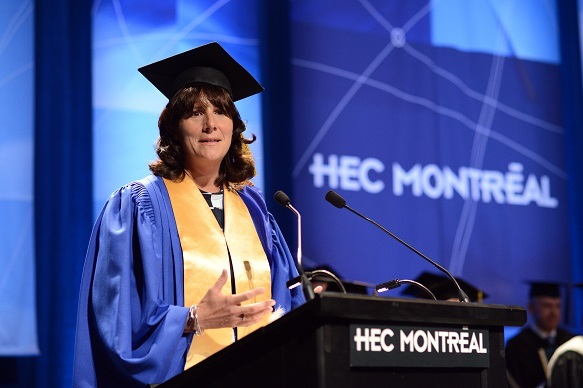 The Université de Montréal, at the recommendation of HEC Montréal, conferred an Honorary PhD to Sophie Brochu, President and CEO of Gaz Métro, at the BBA convocation ceremonies on May 6. Ms. Brochu was ranked as one of Canada’s 100 most powerful women by the Women's Executive Network in 2015, and is a member of the Order of Canada. She has been working in the energy industry for close to 30 years. With a degree in economics from Université Laval, she began her career in 1987 as a financial analyst with the Société québécoise d’initiatives pétrolières (SOQUIP). By 1992 she was its Vice-President. In 1997, she joined Gaz Métro as Vice-President, Business Development. She rose through various positions in the organization, becoming its first female President and CEO in 2007. She launched a major green shift in the company and won the 2014 “Green President and CEO Award” in the large company category, saluting the efforts and excellence of a leader who recognizes the importance of environmental protection and sustainable development. Ms. Brochu sits on the boards of directors of the Bank of Montreal, Bell Canada and BCE Inc., as well as the board of the Fondation Lucie et André Chagnon. She also chairs the board of Forces Avenir, an organization that fosters and celebrates community involvement by high school, college and university students. She is very involved in her community, in particular with Centraide of Greater Montreal, of which she co-chaired the 2010 fundraising campaign. She is also the co-founder of ruelle de l’avenir, a non-profit organization that encourages students in the Centre‑Sud and Hochelaga-Maisonneuve neighbourhoods to stay in school. In addition, she is concerned about women’s place in the business world and issues related to women’s ambitions, and is part of the team of women leaders promoting the Effet A initiative. In 2015, as part of the first cohort, Ms. Brochu brilliantly took on the challenge of mobilizing hundreds of women from all walks of life to build awareness of the cause of homeless women and support Herstreet. “Whether it’s within Gaz Métro or the other companies and organizations that I’m lucky to collaborate with, I work with exceptional, experienced teams dedicated to our common success. I know that this recognition of my contribution is a tribute to their contribution too,” added Ms. Brochu. For all these reasons, Ms. Brochu is an excellent model for HEC Montréal students, alumni and staff. Her exceptional contribution as a manager, her leadership and her community involvement are a source of inspiration for the next generation of Quebec leaders. So it is with great pride that HEC Montréal conferred this honorary doctorate on her today.